We have been busy this spring with 2 new foals and working with young horses. I have the most amazing horse helper for the summer! Her name is Grace and she is quite knowledgable in handling young horses. I have put her to work with our yearling buckskin colt, Jace and the new foals. 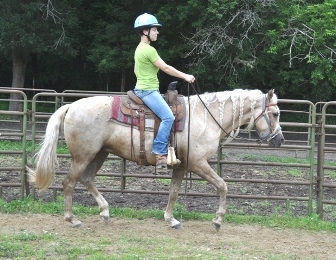 We are also working together to start a mare under saddle. She has loads of experience working with youngsters from baby on up to getting them saddled as well as plenty of riding experience. 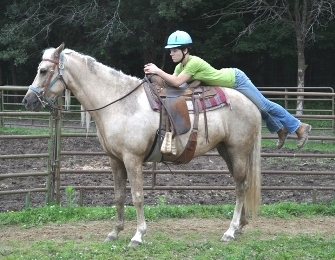 Grace told me the one piece she was missing in her knowledge base was getting them started riding under saddle. I just broke down driving one day when I realized that one thing she was missing just happens to be my passion and what I have studied almost my whole life. And then her name is Grace!! I'm always amazed at my blessings and how I'm shown over and over again how these horses are what I'm supposed to be involved in. Mossrose Golden Ridge and Mossrose Fiesta Gold are our main focus this year for getting more saddle time. Both are so special! I'm looking forward to what their future holds. Getting the using horses in shape, as well as work with the young horses has been going for a couple of months and we are having a lot of fun. I am always humbled and full of respect for each one as I watch the young ones come along. They always amaze me with how smart they are and what great work ethics they have. The Morgan Horse definitely aims to please!! What a pleasure to work with such a creature as this. That trait was one of the first things I noticed with my very first Morgan 25 years ago that was so different from all the other breeds I had worked with. I have been doing round pen work, sacking out, saddling and long lining. John has now started ponying them. So far he is still in the arena as they get the hang of the new routine, but soon they will be out on the trail. I apologize for the lack of news the last couple of years. It all started when I got an Apple laptop after always having Microsoft products! After 2 weeks with the Apple, I thought I may have to return it. It was summer & I just didn’t have the time needed to spend on it to learn it. Of course I eventually figured out how to effectively work with it & get a few things done! However, the website suffered in the meantime. 2015 and 2016 just weren’t good years for us with the animals. Throughout the struggles, we kept the faith that God would see us through. And as promised, He absolutely did!! I am renewed this year with enthusiasm & looking into some new breeding crosses, a new foal & getting some good young Morgans going under saddle. In early March we hosted the Minnesota Valley Photo Club. 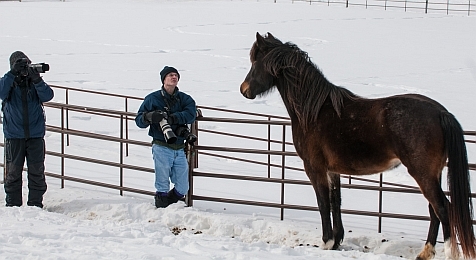 They had a "field trip" to our farm to photograph our Morgan Horses. 23 people came from the club and everyone had a wonderful time, including us! Everyone was so much fun and so respectful. We are hoping to have them out again this summer for some photo opportunities with green grass and foals! Click Here for a link to a YouTube video of some of the Minnesota Valley Photo Club's photos from their visit! I had so many wonderful photos from 2013 that I decided to make a "Best of 2013" video. 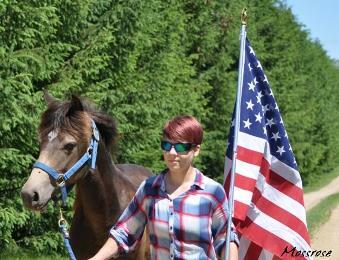 It is a collection of our best photos and best moments we shared surrounding our Morgan Horses in 2013. Click Here for a link to a YouTube video of our "Best of 2013!" SOMETHING NEW! John and I have always wanted to try cowboy mounted shooting, so when I saw a flyer for a new shooters clinic, we just had to sign up!! Our instructor was multi-champion, Chad Little, from St. Michael, Minnesota. John and I were very impressed with the clinic & had a wonderful time. We were amazed at how fast the horses took to shooting off of their backs. The great people helping with the clinic told John that Chief was ready to compete, so the following weekend we went to a competition. I have more training to do on my horse before we are ready to compete, but hopefully it will work out for later this year. John and I had a super time at the competition. John ended up hitting 39 out of his 40 balloons. He was 4th out of 10 in his level. We are now official members of the Cowboy Mounted Shooting Association and the Minnesota Mounted Shooting Association. Who knew we would dive right in?! We have already met a lot of nice folks and hope to continue with some mounted shooting events when we can fit them into our schedule. After our long winter with lots of snow, we were anxiously awaiting our 2013 foals. The due dates kept getting closer an the snow kept coming down. Finally we had a week of warm and both mares foaled within 2 days of each other. I was thankful! We had a small storm dropping a foot of snow after they were born, but I was happy both mares went several days past their due date to wait for nice weather. This year we were blessed with 2 colorful foals! A buckskin colt born first on April 26 and a palomino filly born April 28. Check out the Foals page to see photos. EXCITING NEWS!!! I received an email that Mossrose Ysabella and Mossrose Windfall are featured on Ohio artist Karen Brenner's Blog on February 17th. Check it out with the link below! A year ago I was emailed an invitation from Karen to nominate one of our horses for her "Most Beautiful Horses of Wisconsin" series. She takes all of the nominations & then picks 25 to photograph and paint. Karen's goal is to photograph and paint a series of the most beautiful horses in every state. Karen came out to our farm last June to take the photos. It was a great experience and a pleasure working with Karen. Click Here to go to Karen Brenner's Blog! I couldn't sleep last night, so spent some time digging through old videos I had on my archaic and slowly dying computer. I found an old video I did of Chief (Mossrose Top of the World) for a Farm DVD I created in 2007 to mail to folks interested in our horses. I love this video, so decided to do just a bit of updating to some pictures and videos and re-create it to post on Chief's portion of this website. I thought I would post it here too, so people know to check it out. I hope you like it as much as I do! Click Here for a link to a YouTube video highlighting Chief's jobs and accomplishments! I don't like to make excuses, but we have been so busy doing horsey things this year I have had no time to update our News page in 2011! So a good thing, but also a not so good thing. But here I am back at it ~ updated information and pictures. We did a lot of riding over the winter months starting out 2011, which involves loading up the horses and hauling to an indoor arena. This is so good for them to get regular hauling and to ride in new places. Things really shifted into high gear with the formation of a new club called the Cornerstone Morgan Horse Club. Jane is on the Board of Directors serving as Vice President. The club is a National Service Organization, under the American Morgan Horse Association, committed to promoting and supporting Foundation and high percentage Foundation Morgan Horses in all venues. To find out more about the club, click on the club's logo below to go to the club website. We did a lot of riding this summer. 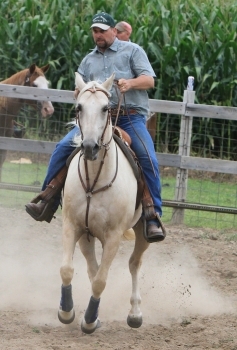 John kept Chief and Stardancer in shape for ranch rodeos. He also worked them a lot on the roping machine. 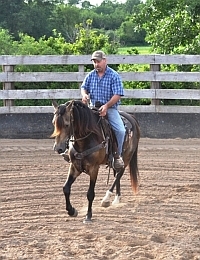 John also worked with Stardancer to make her more useful in the training of young horses. Here she is being used to pony Avalon. Jane also did the same with Ysabella this year. 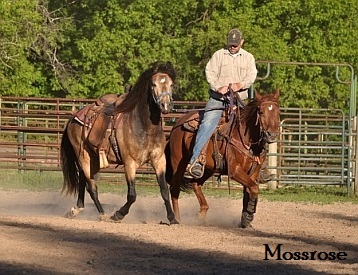 Both mares have really come a long ways this summer in being useful members of our working group of Morgans. 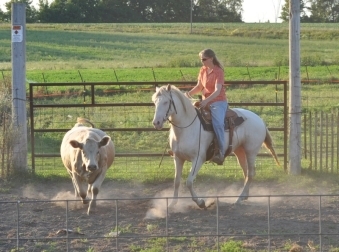 Jane took weekly cowhorse lessons this summer with Mossrose Ysabella. 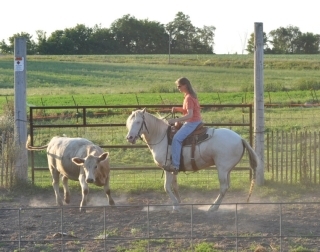 You can see in the pictures below how Bella has learned to mirror the cattle pretty well. Bella made great progress in her training this summer. Next year we can hopefully get her out to some real competitions. Click Here for a link to a YouTube video of Bella's training to date ~ October 2011. 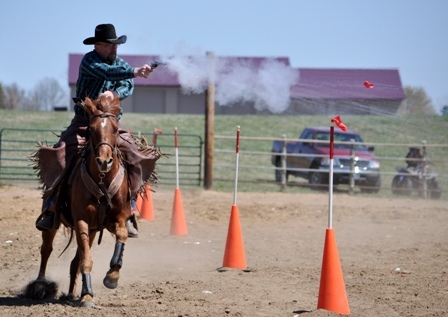 More information and pictures are posted below from this summer's ranch rodeo series and our annual trip to the NMRHA Extravaganza in Lincoln, Nebraska. This fall we found out that the show no longer has the funding to continue. John and I were very sad to hear this. 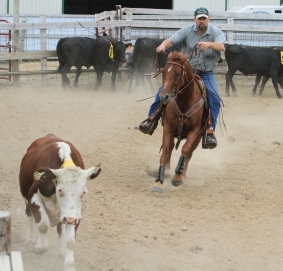 It was one of the few Morgan competitions involving cattle. And the atmosphere of comradery and teaching was a rare find. Thank you to Travis Filipek for putting on this show for all of the years you did. We truly value the friendships we've developed at the show and appreciate Travis' continual selfless giving for the Morgan Horse. 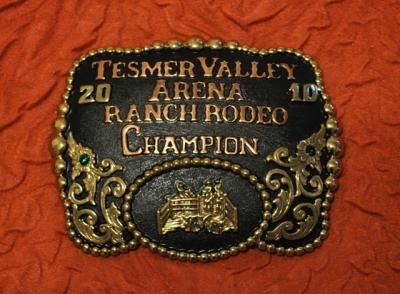 August 27 was the final ranch rodeo of the 2011 series. 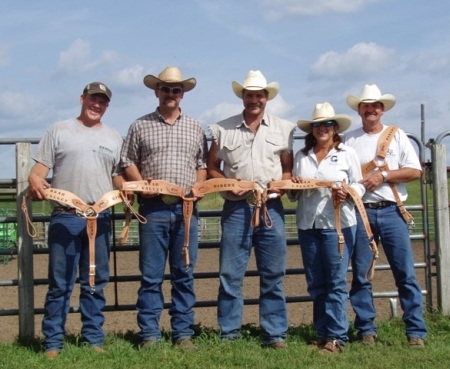 The series started in May and consisted of 5 ranch rodeos throughout the summer. John rode Chief on the Running Iron team. On the Green Team, Jane rode Chief and John rode Red Rose Stardancer. The Running Iron team ended up third out of 14 teams this year. The Green Team ended up fourth for the year. The Running Iron team went on to state competition, but didn't bring home any money this time around. Lincoln, Nebraska here we come! We had a great time this year at the NMRHA Extravaganza. As always, what a super group of folks and what a wonderful show with a unique learning atmosphere. Here is a picture of some of the Morgans that competed this year. 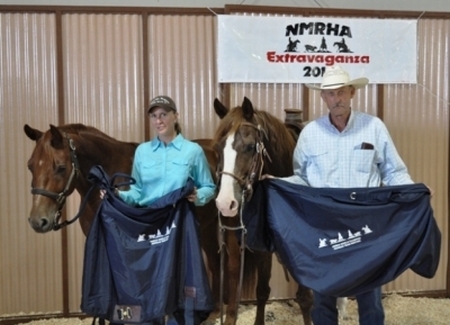 Jane partnered up with Paul Banzet, from Kansas, to win the NMRHA Extravaganza World Champion Morgan Ranch Horse Sorting again this year. 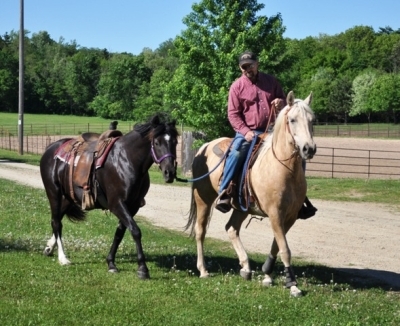 Jane and Paul ride Morgan geldings that are half brothers, both being sired by World's Edge Goldhawk. 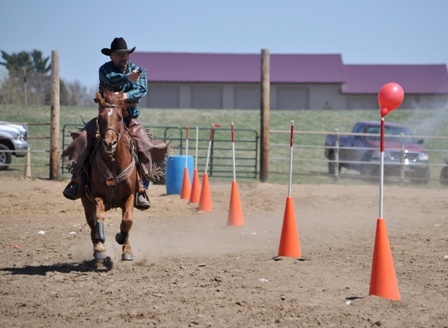 A working cowhorse clinic was put on by Monty Bruce this year. Travis Filipek has some wonderful ideas and this clinic was one of them! The first day was spent doing exercises to take the resistance out of our horses along with some boxing work with the cattle. The second day was work on the reining pattern & then work on taking the cattle down the long side of the arena. The third day was a real class judged by the Extravaganza event judge with Monty on the rail coaching the participants. Jane won this class riding Chief (Mossrose Top of the World). It was a great time & such a neat event to be involved in! 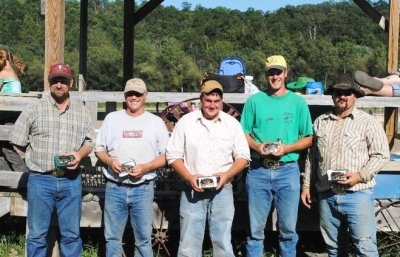 John attended the Minnesota state ranch rodeo finals the second weekend in September. He was with a new team this year. Every year the team he is on seems to do a little better. He is working his way up. This year the team ended up in 8th place out of 35 teams. 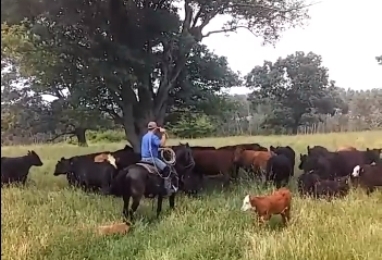 While John was at the state ranch rodeo finals, Jane spent a week in Connecticut at Whippoorwill Morgans and McCulloch Farm. Mary Jean Vasiloff has been meticulously breeding classic Morgans of ancient bloodlines for 65 years. Mossrose Morgans has based their breeding program on the Whippoorwill Morgans. We did visit McCulloch Farm 8 years ago, but Jane wanted to see the Final Versatility Event to be held at McCulloch Farm. It was a superb event, very well run and showcasing the versatility of the Morgan breed. Jane came home with 1,850 pictures and 6 hours of video. If Jane's computer cooperates, there may be a DVD of the event available in 2011. Jane took part in the Western Riding section of the Versatility Event and demonstrated the working western horse riding Whippoorwill Apollo. John signed up to be in a ranch rodeo series this summer. It was at a new arena that he had never competed at before. We met a lot of nice people and enjoyed the competition. John was on one team this year and that team earned the most points for the series resulting in a first place finish. That earns the team a trip to the state ranch rodeo finals in September. 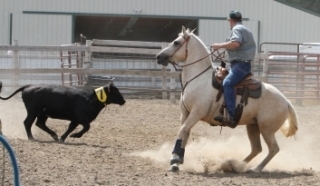 The series consisted of 5 rodeos throughout the summer. 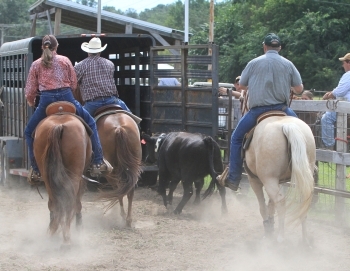 A ranch rodeo has 4 events: Team Sorting, Doctoring, Trailer Loading and Team Penning. John rode Mossrose Top of the World - aka "Chief." Chief is really racking up the prizes and buckles and bringing home the paychecks time and time again. He has earned thousands of dollars and continues to just get better season after season. 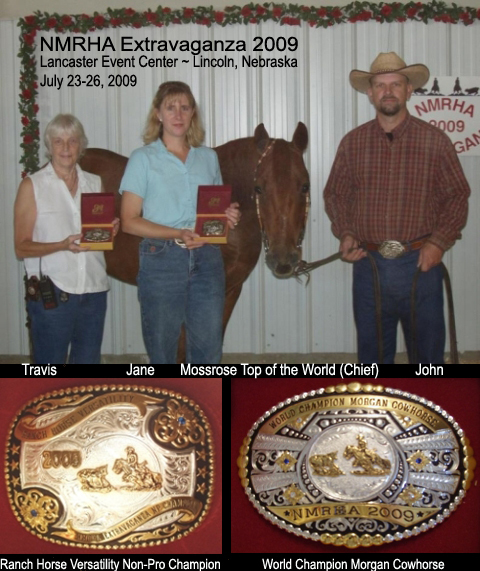 We hauled Mossrose Top of the World (Chief) to the NMRHA Extravaganza in Lincoln, Nebraska again this year. 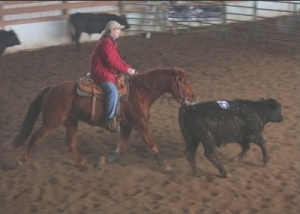 He competed in only one event: Ranch Horse Sorting. 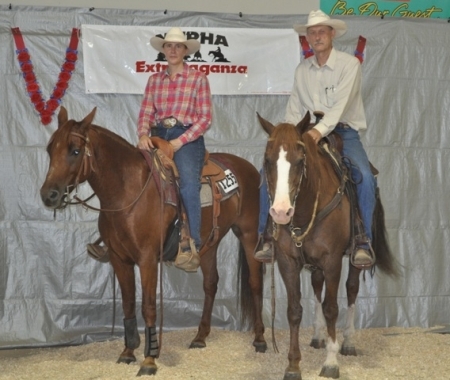 Jane and Paul won the NMRHA Extravaganza World Champion Morgan Ranch Horse Sorting. It is always a fun show. Please contact us if you want to know more about the classes or the show. If you have an interest in the ranch horse versatility, sorting, reining, cutting or working cowhorse, this is an exceptional show to attend. The atmosphere is pleasant and very friendly. It tends to be a learning environment with a lot of fun and knowledgeable people. The following is a story John and I wrote on our way home from the NMRHA Extravaganza in Lincoln, Nebraska in July 2009. 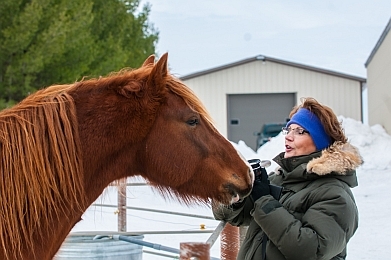 The story was featured in the View from the Ingate section of the November 2009 issue of The Morgan Horse breed journal. We have a little red horse. A Morgan horse. Everyone says he is cute, but he is mostly non-descript. Ride him into an arena with cattle and you will see a focused cowhorse, anxiously awaiting direction for the serious job at hand. At home in Wisconsin, Mossrose Top of the World (World's Edge Goldhawk x Carmida Mist), "Chief," is the main competition horse for John and Jane Pietenpol. 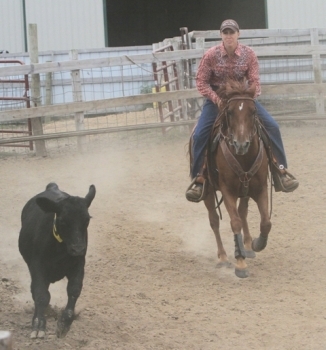 John uses Chief in ranch rodeos, which include team penning, team sorting, trailer loading and rope & vet. 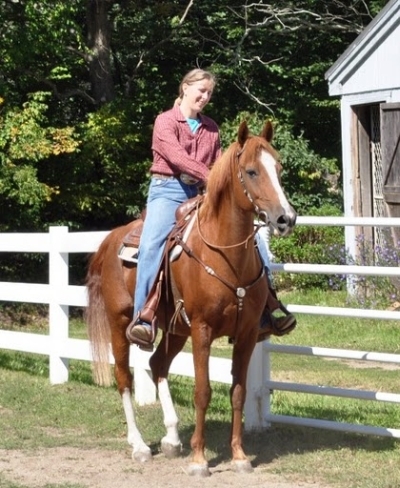 Jane uses Chief for two person sorting and for giving many kids their first ride on a horse. 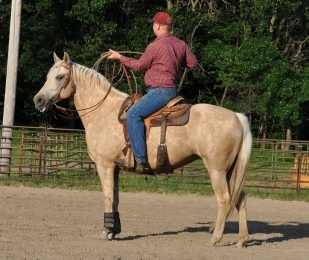 Chief is also John's heel horse for team roping. We don't train specifically for any of the classes at the NMRHA Extravaganza, but we feel it benefits the Morgan breed by participating in the show. The working western Morgan is our passion and the Extravaganza is a show that helps to build on this part of the Morgan breed. Prize money and one mighty fancy buckle proclaiming the NMRHA World Champion Morgan Cowhorse were up for grabs this year. The winner was the horse with the highest combined total points in Working Cowhorse, Ranch Horse Versatility, Cutting and 2 Person Ranch Sorting. The competition was tough and we are honored that our horse was able to claim this admirable title. We don't go to the Extravaganza expecting to win top honors, but we do it to help support Travis Filipek in what she is trying to accomplish; generating interest among Morgan owners to show their talented Morgan horses in cattle related events. Morgans were one of the original stock horses and this event is promoting that type of horse. We are not anything special. We raise 2 foals each year, do all of our own training and promote the Morgan horse where we can in local and regional arenas. You can do it too! If you have a Morgan that you enjoy doing cattle work on or reining, you should consider attending next year's event in Lincoln, Nebraska. You will meet a great bunch of people who all want to show that the Morgan horse can be competitive with other breeds. 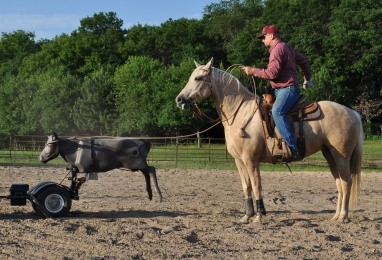 A completely trained horse in a specific discipline is not required, just a desire to show your horse and have fun. Chief is proof of that. The ranch rodeo season ended up pretty good for John. He was on 3 teams this year riding Mossrose Top of the World. He ended up with a first, second and fifth place finish on the 3 teams at the end of the year series. We made the annual trek to the NMRHA Extravaganza in Lincoln, Nebraska. Another amazing and fun trip spending time with old friends and making new ones along the way. 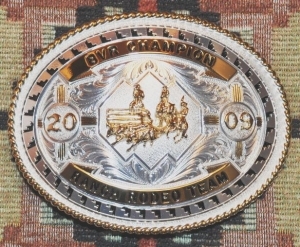 2009 started out right with a buckle win on February 7th. Riding Mossrose Top of the World, Jane and her partner Kati, won the 2009 Rimoe Ranch Rookie Sorting Series. There are video clips of our final two runs on "The Boys" page. In the Fall of 2008, John rode Mossrose Top of the World to a year end finish of second place in the Bear Valley Riders Ranch Rodeo series. July of 2008, we traveled to Lincoln, Nebraska for the annual NMRHA Extravaganza. 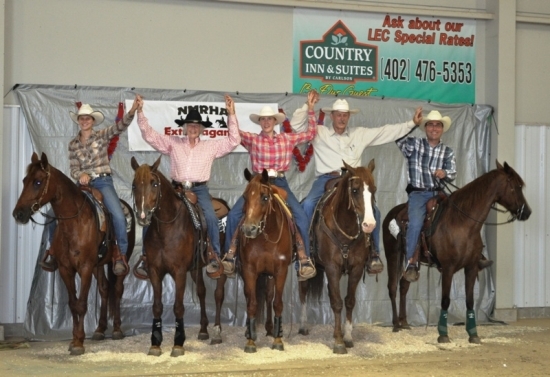 Mossrose Top of the World and John came out as the Non-Pro champions in the Ranch Horse Versatility Class. 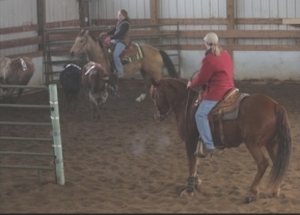 The class is composed of five different events: ranch cutting, ranch riding, conformation, doctoring and ranch trail.